Louis, Zayn and Naill have been into Stockholm’s OnePiece store to pick up some new OnePieces this week! One Direction first jumped in their OnePieces back in November last year when they appeared on X Factor rehearsing in them, and also in their popular video diary, all zipped up. They were captured right across the media world posing in their brightly coloured OnePieces, and now… they’re back. OD supporters have been getting their hands on their own OnePieces since the five boys first wore theirs in public, and this latest shopping spree renews excitement in the jumpsuits with Louis, Zayn and Naill wearing some great designs. 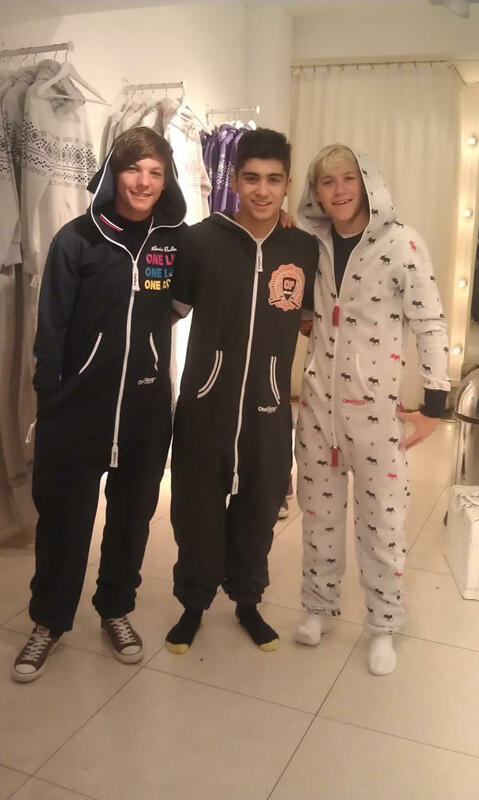 Left to right – Louis in a One Life OnePiece, Zayn in a College Player OnePiece, and Niall in a new Moose OnePiece. Keep up with the OD boys with your own OnePiece from the UK online store. New OnePiece designs available soon.